Set in the idyllic and picturesque Gold Coast Hinterland within the foothills of Tamborine Mountain, you will find this stunning private retreat, Riverwood Estate. 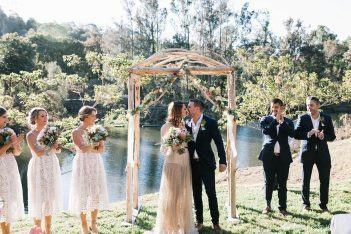 Nestled along the banks of the Coomera River, with lush, green surrounds as your backdrop, this private estate acreage property is perfect for couples wanting the romantic and laid back country wedding feel with a difference. 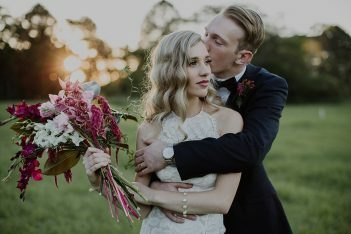 We are a blank canvas with no restrictions on your dream vision, here at Riverwood Weddings you are only limited by your own imagination for your perfect day to be as unique and special as you. Incorporating your whole wedding day experience with ceremony, canapés and reception – with lots of photos in between! 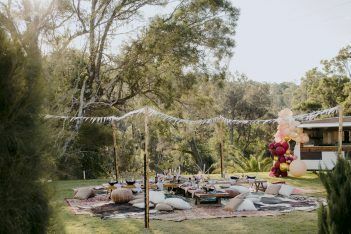 Wow guests with a truly unique experience whilst being so close to the central Gold Coast for total convenience and ease, Riverwood Estate is situated less than 40 minutes from Surfers Paradise or less than 20 minutes from Sanctuary Cove. We have 3 x Luxury 5 Star Villas in the North of Bali and offer all of our Riverwood Couples a 20% Honeymoon Discount. 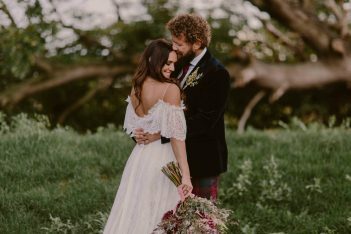 Check out Kumara Villas Bali on Facebook for our Villa info and have a luxury getaway after your wedding with fully staffed and serviced Villas to relax and enjoy. Riverwood Estate is our families privately owned residence situated on 7.5 acres in the Guanaba Valley along the Coomera River. I grew up here with my sister and 3 brothers, playing in the river over summer before we were lucky enough to get a pool – which I was not living here to enjoy by then! We’ve had horses and motorbikes and roamed around our beautiful valley for so long – to see it change now to be so close to “town” compared to 15 years ago is unreal. Town has come to us but we are still Country living with loads of privacy. We have lived here for over 24 years and our parents have nearly hand-planted each and every tree, bush or flower on this property with love and care. Many people who come here for the first time are amazed at this little piece of paradise as it is so serene, quiet, peaceful and above all I think, a truly blank canvas outdoor venue that can turn your dreams into a reality for your perfect day. Riverwood is our parents home and we had our engagement at Riverwood, and years later my younger sister Sophie hosted her engagement party as well. We had soooo many wonderful comments on the estate at the engagement party that guests literally thought we were hosting a surprise wedding! So there was really no other option but to succumb to Sophie’s (Princess) whim and our parents actually levelled a section of the land and built a rock retaining wall which created a large flat, elevated reception site overlooking the river to fit the 2 Tipis she wanted – custom made for Tipi’s haha! The property has found its calling and is a very unique space to view. We're Phil, Bek & Tammie… photographers. We tell stories of people in their realest moments... their stories burst with heart and colour.